Optium Blood Glucose Monitoring System: Medisense Optium Test Strips Have Been Designed To Prevent Inaccurate Tests And Test Strip Wastage Caused By Interferences From Many Common Substances* And/Or Application Of An Inadequate Sample Volume. 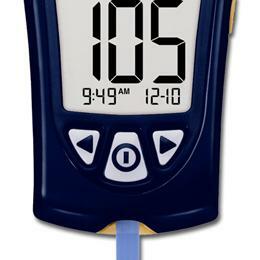 Application Of Inadequate Blood Samples In Some Blood Glucose Monitoring Systems Can Potentially Lead To Erroneous Results Or Error Messages Which Means Wasted Test Strips. A Unique Fill Trigger Prevents The Test From Starting Until An Adequate Blood Sample Is Applied. Simply Add More Sample And The Medisense Optium Meter Produces A Result Without Compromising Accuracy. With A 450 Result Memory, Down Loading Feature And A Large Easy To Read Display, The Medisense Optium System Can Handle All Of Your Blood Glucose Testing Needs. (Not Available For Distribution To Hme Dealers)* Examples Include Uric Acid, Vitamin C, Sulfonylureas And Aspirin Optium Glucose Test Strips 12 Bx/Cs, 50 Ea/Bx.